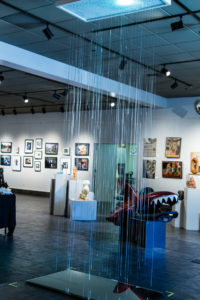 From The Trenches is an exhibition highlighting a selection of artworks by art students from local and not so local California colleges and universities. We brought together a rich and varied collection of works reflecting a broad range of interests and approaches to expressing ideas and working with various media. Marianne Ward, chair of the Exhibition Committee at Central California Art Association and Mistlin Gallery, approached me with the idea for this show. She wanted to develop greater inclusion by targeting a group of artists that has not been traditionally included on the annual exhibition calendar of the gallery: college art students. 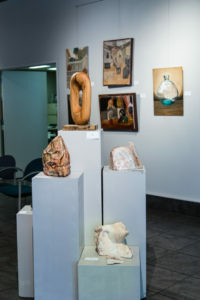 These art students are undergoing the oftentimes brutal rites of passage that include working on creative projects in the classroom alongside competing students, suffering the challenges of hostile critiques and submitting artworks to public exhibitions for the first time while still unsure of themselves and the quality of their work. Sometimes assigned technical challenges and subjects they are unfamiliar with, or without much guidance, they experiment, desperately seeking resolutions armed with little more than their own experiences. Sometimes they are asked to question the very processes that engaged them with the arts in the first place. Sometimes they are asked to dig into their own biographies, biology, and psychology to reveal very personal details and attitudes generally hidden from society, family and themselves. Some students, scarred and angered by overprotection, neglect, abuse, accident or economic misfortune, are still struggling with maturing and defining themselves. Others, sure in their social positions and attitudes, focus on subjects and processes honed through years of experience with their chosen art. In other words, approach these artworks with an open mind and with the faith that they were produced by students with the good intentions of fulfilling the requirements of their assignments while simultaneously attempting to define themselves as persons and artists: a sometimes scary, confusing and overwhelming process. The title of this exhibition came to me as I contemplated who these students are and where they are producing their art. They are the foot soldiers of the next generation of artists, skirmishing in the trenches for a clearer sight of their objectives within a battlefield in which their domain is not given much attention. Our Great Central Valley, bounded on all sides by mountains, though proudly the food basket of the nation, is a great trench from where it is difficult to experience the highly cultured and fast-paced art worlds of the Bay Area, Los Angeles basin and beyond. New York and Paris are foggy, undefined dreams to most of these students. This exhibit was conceived as a way to bring these art students together in the hopes of building a stronger art community and to help them see themselves as an important cultural component. Finally, I hope to inspire them to continue creating during their time away from the classroom. I worked with Professor Cheryl Barnett of Merced College and my former Modesto Junior College art student Randy Ammon, now at CSU Stanislaus, to attract artists. We contacted 42 of the best undergraduate art students across the region. These students are from our three local campuses and a number who have transferred to art departments at various CSU and UC campuses throughout California. These include: CSU Stanislaus, San Jose, Sacramento, Chico, Humboldt, Long Beach and Fullerton, as well as UC Berkeley, Davis, Santa Cruz and San Diego. Thanks to the membership of the CCAA for making this show possible. Special thanks for the efforts of those (you know who you are) who helped receive, hang, tag and light the show. The public is invited to receptions for the artists on two 3rd Thursday Art Walks (July 21 and August 19: 5:00 – 9:00 PM) featuring music, hors d’oeuvres, soft drinks and wine. Editor’s Note: Some of the exhibition’s art works may not be suitable for young children.